CINCINNATI – Tom Hayes' career at Xavier University could have fallen victim to his outside success. The 40-year veteran of Xavier University's faculty, who was named dean of the Williams College of Business Monday, co-founded SimpsonScarborough, a marketing and branding business for universities that had grown exponentially. By 2012, "The company had grown so fast that I had to decide between there and Xavier," he said. It turned out to be no contest. "I will always choose Xavier," Hayes said. He sold his share of SimpsonScarborough and focused on teaching and his duties as chair of the marketing department. Hayes' loyalty was rewarded when XU chose to promote him after conducting a national search following Dean Brian Till's departure to lead the business school at Marquette University. Expanding his role at the business school helped fill a void left by leaving SimpsonScarborough behind. "I just have a lot of energy, and I wanted more of a challenge," he said. Hayes, 62, is a true believer in XU's mission, a passion that began in childhood when he watched his father, Kaney Hayes, teach economics there and later become associate dean of the business school. He began teaching at Xavier in 1976 after completing degrees in psychology and an MBA. With the exception of a one-year sabbatical when he shadowed Kenyon College's president as an ACE fellow, Hayes never left. "I've grown up on Xavier's campus. I've worked for every dean that the college has ever had. I literally would know every professor (a graduate would ask about) since this business college began. "I plan on being outside more than I plan on being inside the building," Hayes said. "The one thing I can bridge is that I bring a lot of passion and history to share with the community. If I can't represent us well, I'm not sure who can." Hayes said the business college has opportunities for growth. "I think we're strong, but we could be a lot stronger," he said. He wants to expand on recent efforts to add experiential learning – learning through hands-on experience – to business degrees. Marketing students now develop entire marketing strategies for private companies as part of their degree. Senior business majors are entrusted to choose where to invest $2 million of Xavier's assets every year. "There's a lot of cool stuff happening. The question is how do we expand that," Hayes said. The business college recently added a master of science in customer analytics and master of accountancy. Its bachelor of business analytics, which blends marketing and management information system (MIS), has been well received. Now, Hayes wants to build on that success with more partnerships with Tri-State companies and teaching more skills that respond to the rapidly shifting demands of businesses. The new degrees were born from extensive interviews with business leaders to find out what skills the work force was lacking. The college proposed new degrees, tweaked the details after more feedback, and rolled them out. "It really boils down to telling us what to do," he said. Undergraduate enrollment in the business college has been steady in recent years while graduate enrollment dipped before leveling off. With literally thousands of four-year colleges as competition, XU has to continue distinguishing itself. Hayes said that his pitch to students and parents wondering if tuition at the private university is a good investment includes pointing to the strong sense of community that students feel. "The No. 1 thing students are looking for is the concept of community. 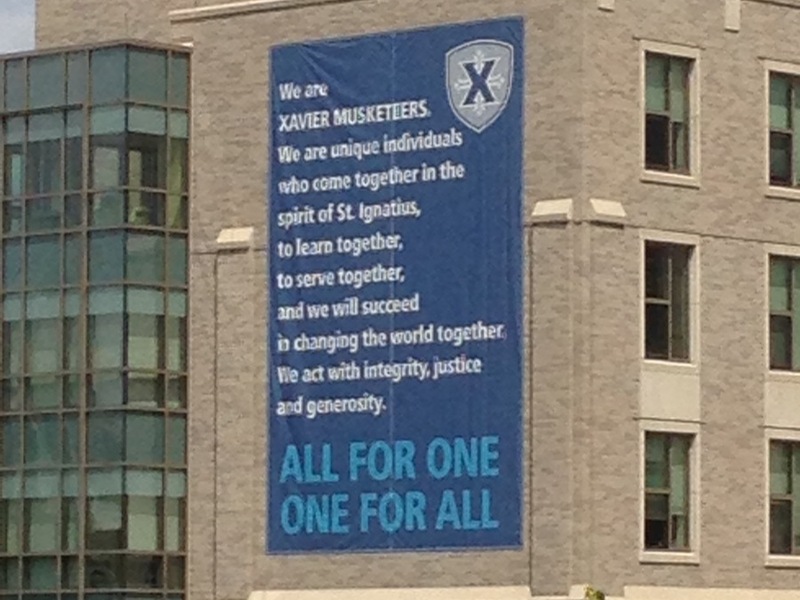 The Xavier creed that was written by students last year uses the word 'together' four times," he said. Xavier's creed, developed by students in 2015. Photo by Bob Driehaus | WCPO. As a Jesuit university, a moral, ethical component runs through the programs as a counter as an antidote to potentially cold-hearted capitalism. "It's really important to build business ethics through every class you have," he said. "Our university is not for everybody, but we will know your name in every class. You're not going to be a number," he said. Xavier has competed with huge state universities by being quick to seize opportunities, Hayes said, like starting part-time MBA programs in Columbus and Lexington, Kentucky when Ohio State and University of Kentucky didn't offer them. "Unlike our competitors, we taught on weekends, at night, off campus. Wherever the the need was, we went," Hayes said. Part of the DNA of Xavier is the idea of being close to the ground and being customer-focused – the customer being both students and the business community." Hayes already visited top business leaders while he was a candidate for the dean position, but he plans to redouble his efforts in the coming months to learn more about what executives see as XU's greatest strengths and weaknesses. "Personally, I always want people to love Xavier as much as I do. My job is to convey my passion so that other people feel it," he said.